Thats awesome jerry! Thanks again!! Gordo that Blackdog dude is one of the worst offenders of driving prices of parts through the roof! I still need a haney volkswagen !! I got a capilano vw for trade. Shop local And keep the pricing fair , who would of thunk that the one licence plate a good fellow member needed , that others are just hanging onto would be hiding on the back of a Veedub hidden by the the tall grass Awesome !!! Well, all i had to go by was on the samba. Good to know that. I guess i am open to an offer on these plate frames. They are a cool looking set. This will be a great event to trade buy or sell your plate frames! 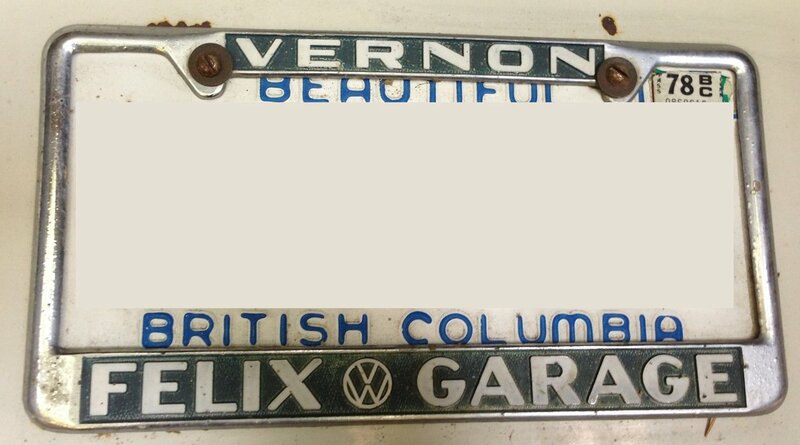 Dibs on a Harrison Nanaimo Volkswagen plate frame like there's a huge demand but damit I need one !! Funny thing is............. after we spoke and I said I hadn't seen one in my travels, well... I got home and walked past my Porsche Bus and thats what I have on it! i think Geoff has the "holy grail" under his bench at the shop. Likely bought it in a box of parts! not a hoarder, they just keep stuff. Geoff moves stuff along to vw peeps who need it. I have a sweet metal Speedway Motors frame. Strange, but it was found it in the forest deep underground. All of the frames... how about plates? I have a '56 set of plates, a'66 plate, and a few years newer white with blue plate. My Ghia came with original frames from Lodi California,but they aren't in great shape.Can these things be restored? I sent him a couple broken frames(non-VW) for material in his business. Good communication, but haven't ever sent him one to repair so cannot comment on quality. Thanks,maybe I'll send mine off when the car is near finished. Looking for 2x speedway motors plate frames !